One runner changed her diet—and it changed her life. 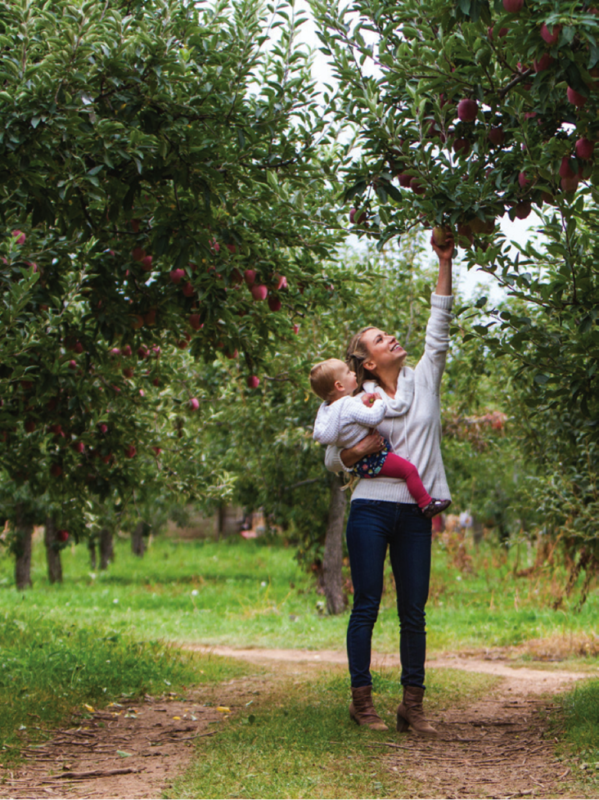 Elyse picking apples with her daughter, Lily, in Hood River, Ore. I started running competitively in seventh grade. I was a scrawny, prepubescent 12-year-old with a competitive spirit that enabled me to beat most of the boys on my middle school cross-country team. The more the boys picked on me, the faster I ran. The coach noticed my talent and boundless drive and moved me to varsity. In running and competing, I found my true passion. But as I happily logged more and more miles and fueled my running with what I thought was nutritious food, my health began to suffer. At 14, I developed stress fractures in both my knees. By my 16th birthday, I was just as scrawny as I had been at the age of 12. When I turned 18, I feared I was the only teenager in the world without her period. It wasn’t until I joined the cross-country team at the University of North Carolina at Chapel Hill that the team doctor red flagged my absence of menstruation. My bone density was low, and they suggested I go on birth control pills to increase my estrogen levels. This resolved the immediate issue—I got my period—but didn’t address the root cause of why it hadn’t happened without drugs. After college, when I was no longer running competitively, I tried several times to go off birth control to see if I would get my period naturally. I waited, anticipated, cried, switched doctors, stopped running, but all to no avail. I always ended up back on hormone replacements. Not once did a doctor suggest dietary changes to assist with combating “athletic amenorrhea,” the term I learned many years later that described my condition. It never crossed my mind that the low-fat “health” foods I consumed regularly were causing more harm than good. A decade after graduating from college, my husband, Andy, and I had the chance to move abroad to Geneva, Switzerland, and my diet changed drastically. I was no longer eating low-fat yogurt for breakfast followed by a lean turkey sandwich for lunch and a processed veggie burger for dinner. The packaged products I was used to buying in the U.S. didn’t exist, so I began cooking everything from scratch. For the first time in my life, I was enjoying foods rich in healthy fats including traditionally made cheeses, grass-fed red meat and farm-fresh eggs. The whole milk yogurt I ate every morning was rich, creamy and pure. My new diet was satisfying and delicious. My perspective on healthy eating changed. I happily discovered that food could be indulgent and nourishing at the same time. My weight did not change, but I felt stronger and healthier than ever before. After living in Switzerland for a few months, I decided it was time to toss out my last package of birth control. To my surprise, a month later, and for the first time in my life, my period came naturally. When we returned to the U.S., I was inspired to learn more and went to New York City to study at the Natural Gourmet Institute for Health and Culinary Arts. Once back in my home state of Oregon, we decided to start trying for a baby—doctors told me pregnancy wouldn’t be quick or easy for someone with my history. We were surprised and thrilled to discover that I got pregnant immediately. The doctors had been wrong. I didn’t need hormone therapy, IVF or other medical interventions in order to get pregnant—all I needed was a hearty, healthy diet. Lily, our daughter, has truly transformed my life: I’m now an elated mother and an eat-more-fat evangelist. Lily has inspired me to share what I know about nutrition so that no athletic woman suffers from health issues due to improper fuel. Last year, I found the perfect way to speak out, partnering with longtime friend and Olympic marathoner Shalane Flanagan to write a cookbook geared toward runners, Run Fast Eat Slow (September 2016, Rodale). When I began the research for our book, I learned women in the U.S. are experiencing infertility rates at an all-time high. It’s estimated that 20 percent of active women and up to 45 percent of female competitive runners suffer from athletic amenorrhea, which can lead to bone loss and fertility issues. When the body isn’t getting enough healthy fuel, it begins to shut down functions that aren’t necessary for survival—and the female reproductive system is one of the first to go. Getting in more high-quality calories can reverse this detrimental condition. Whether you’re in your teens or 20s, 60s or 70s, or anywhere in between, and no matter if you’re a beginner or advanced runner, a balanced diet rich in good fats is essential for your bones, heart, brain, hormones and more. Unfortunately there is still a fear of fat in our country. The reality is fat doesn’t make you fat; good fats are an easily burnable source of sustainable energy. Now I’m in the kitchen every day, cooking indulgent favorites to keep my active family happy and healthy. Since fat is essential for brain development in toddlers, nothing gives me more satisfaction than watching Lily devour buttery carrot muffins, slurp rich bone broths, slather kale pesto on bread, clear her plate of coconut oil–roasted sweet potatoes (in fact “coconut” was one of her first words) and eagerly hand signal for more sardines. Elyse Kopecky is a chef, recipe developer, health consultant, author and most proudly a mother. Run Fast Eat Slow: Nourishing Recipes for Athletes is out Aug. 9, 2016 (runfasteatslow.com). A graduate of the Natural Gourmet Institute for Health and Culinary Arts, she can be found at IndulgentNourishment.com, @ElyseKopecky and on the trails in Bend, Ore.